The Père Lachaise Cemetery in Paris, France is one of the most famous cemeteries in the world because of its celebrated occupants and artistic tombs. Built in the 19th century and established by Napoleon I, the Père Lachaise Cemetery, also known as the East Cemetery, is a popular destination for tourists. The artistic styles of the tombs have been described as being: Gothic, Art Nouveau, and Art Deco. In the 1800’s the East Cemetery was considered too far from the city; thus few funerals were held there. 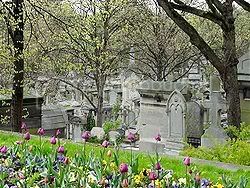 Other cemeteries in Paris include: the Passy Cemetery near the Eiffel Tower, the Montmartre Cemetery in the north, and the Montparnasse Cemetery in the south. In an attempt to attract more patrons, a brilliant idea was devised by the administrators of the Père Lachaise Cemetery. The remains of famous French citizens were transferred to the East Cemetery. Within a few years, an interest in the cemetery increased, and more funerals were held. The list is immense, but I will mention just a few famous people who were buried at the Père Lachaise Cemetery with interesting tombs. This photo is courtesy of Wikipedia encyclopedia. 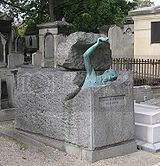 The internationally famous Irish playwright Oscar Wilde was buried at the East Cemetery. 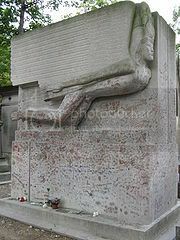 A modern angel on the tomb was designed by sculptor Sir Jacob Epstein. Like other works of art allowed to be viewed by the public, this sculpture was defaced and parts of the original anatomy of this (male) angel remain missing. 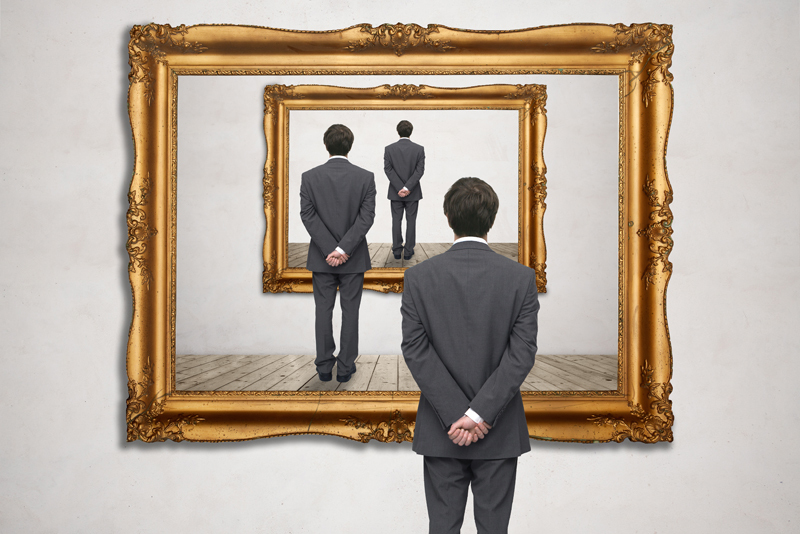 Georges Rodenbach was a French poet who lived in the late 19th century. He too was buried at the East Cemetery with an interesting tomb. It appears the man is trying to escape his inevitable fate. Jim Morrison was the lead singer of "The Doors" and died in Paris in 1971 at the age of 28. He was truly an amazing, talented singer and poet. He was one of the many celebrities who were buried at the Père Lachaise Cemetery and whose tombstone was subject to vandalism. In 1973 the marker on his grave was stolen. In 1981 to commemorate the 10th anniversary of his death, a bust was made by the Croatian sculptor Mladen Mikulin. This too was defaced and stolen in 1988. Jim Morrison’s father placed a flat stone on Jim’s grave in the 1990’s with the inscription "true to his own spirit," a befitting tribute to the life of Jim Morrison. You can own a poster of Jim Morrison's grave before the bust was stolen.